Ethiopian Food! And Bahir Dar, Too. 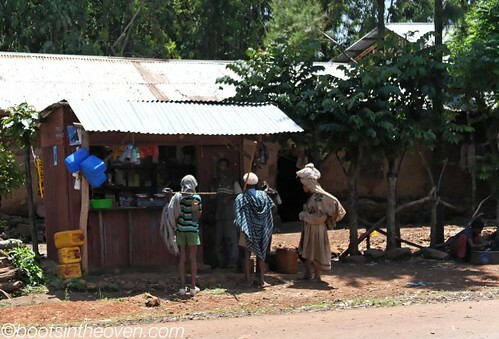 Once we bailed out of Gonder we backtracked a little to the south for a visit to Bahir Dar. 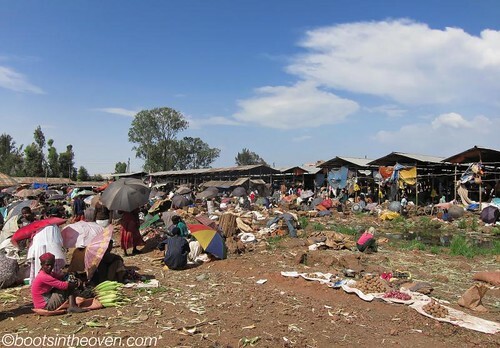 Bahir Dar involved illegal drug dens, disturbingly rundown hostels, and fascinating markets. Still on the road. No, this is not the hostel. 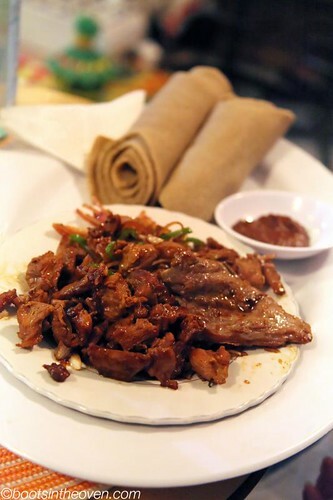 But first, a few notes on Ethiopian food. It's hard to tell from visits to Ethiopian restaurants in the States, but Ethiopians are crazy for raw beef. Like certifiably nutso for it. Entire eating establishments make their living selling nothing but big chunks of meat and a chili mix called mitmita. If you're lucky you get a knife too. Just hack off a hunk, dip in the spicy, fragrant salty-powder, and enjoy. We didn't actually partake of the huge bricks of raw meat, as several health and hygiene concerns proved insurmountable. However, against Rachel's better judgement (and also threats of "if you get tapeworms, I'm leaving you") I couldn't stop myself from diving into a big bowl of kitfo. 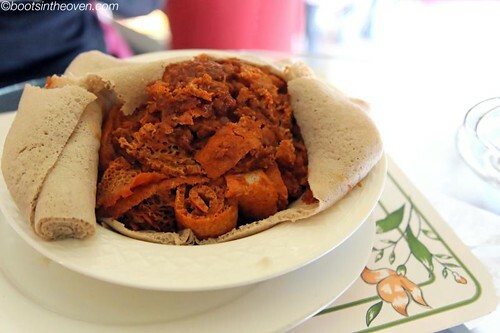 Kitfo is probably the closest thing Ethiopia has to a national dish (don't believe anyone who says it's doro wat). Kitfo is minced beef, mixed with spices and warmed through in a fragrant butter called nitr kibe. You can get it either raw (tere), lightly cooked (lublub), or well done (yebesela). The well done reminded me of bad taco night growing up, but the raw (and even the lublub) is quite spectacular. The Gurage, who are credited with inventing the dish, like to serve it with gomen (wilted greens somewhere between spinach and collards) and eib, a nice salty, crumbly cheese. It also comes with kocho, a rubbery bread made from the stem of the enset or false banana tree. The combination is like cocaine, but you know, for your mouth. 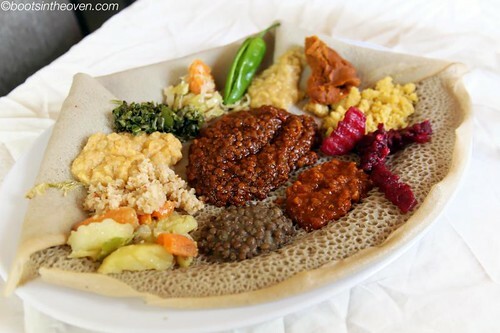 All of the meat frenzy is offset every Wednesday and Friday, known as fasting days, when a large majority of Ethiopians (and Ethiopian restaurants) go completely vegan. Often the only option is the bayinetu, a mix of all kinds of lovely lentils, greens, pastes, stews, salads, beets, and anything else non-meaty. All of the versions we had were delicious and some of them were downright amazing. I'm afraid this may be the best tibs I'll ever eat...sniff. When it comes to breakfast, you'll most commonly find tibs or fir fir. Actually you'll see both at anytime of day, but they're particularly popular in the mornings. Tibs is a broad catch all term (literally meaning fried) for little chunks of beef, goat, or sheep, cooked with onions and the occasional pepper in a light butter sauce. Or lots of other sauces really. 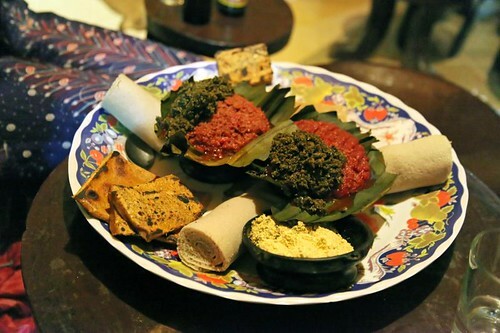 Fir fir (or fit fit or fir fit or, well, you get the point) is small pieces of injera soaked in a sauce (again, any sauce really) and then served with injera. Yo dawg. I herd you liked injera with your injera so I got you some more injera to eat with yaw injera. Occasionally you can find ful as well. 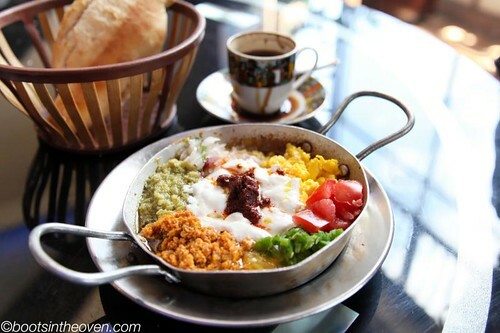 While popular all over the middle east and parts of Africa, the Ethiopians have a knack for fancying up the often bland bean paste with eggs, peppers, onions, tomatoes, and lots of garlic. If you can find it, please eat some more for me. Now on to Bahir Dar. Basically, I didn't really like it. Yup. Not my favorite place. We showed up with a bus driver who refused to drop us off where he'd agreed, walked out of the hostel we'd reserved because, well, because gross- and then it rained on us a lot and the power went out. 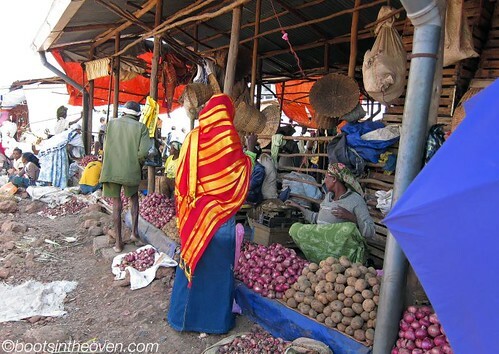 However, Bahir Dar does have a truly fantastic market. I mean check this place out. I loved how all of the coffee is sold green. 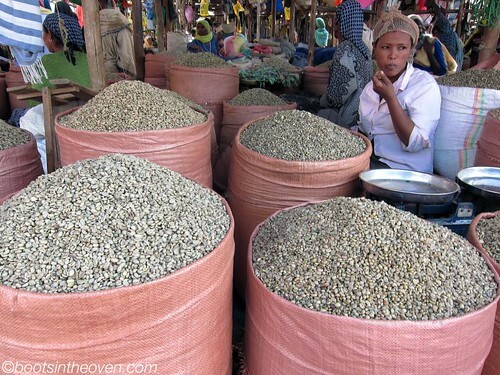 Any self respecting Ethiopian roasts their own right before grinding and brewing of course. Despite several groups of children trying to dissuade us from visiting (they insisted we wanted the supermarket down the street), once we arrived everyone was incredibly friendly. In addition to all the food stuffs, they have a section selling great fabrics and scarves, and dresses that make Rachel look hilarious. How I missed getting a picture I'll never know. We also got led down some tiny alleyways to some guy's family silver shop. 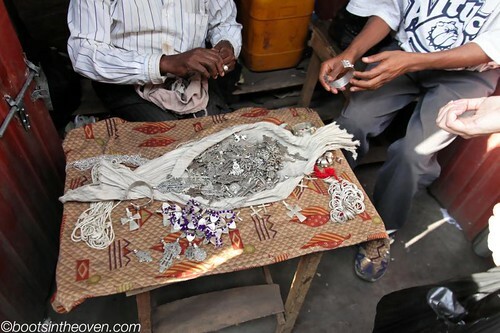 The anklets, charms, necklaces, and bracelets they were turning out were quite impressive. And I appreciated the "we keep it all in this sack" approach to salesmanship. Later that evening, a couple of dudes (Addis and Yohannis actually) convinced me that I needed to go chew chat leaves with them. Chat is a mild stimulant and euphoriant that is totally illegal in the US. They assured me the place was close by, but after 30 minutes of wandering down muddy backstreets I stopped believing them. Finally we came to a huge unmarked steel door. They knocked and a little peep hole slid open and some shifty eyes examined us. Words were exchanged and we were summarily let into a smokey labyrinth made up of plywood rooms and faded cloth hangings. Turns out that while chat is legal, smoking tobacco in a hookah is totally outlawed. Huh. They guys assured me that the place hardly ever gets raided and there was totally a back way out. Sounded good to me. 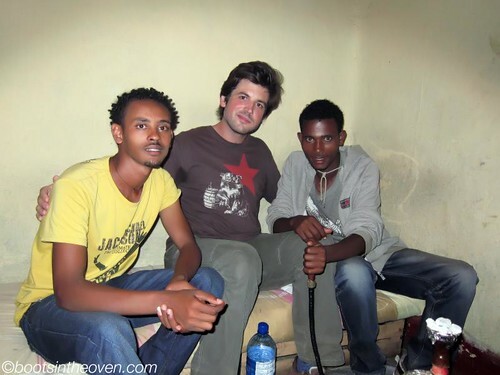 Have you always wanted to see Logan real sweaty and in what looks like an Ethiopian crack den? You win! 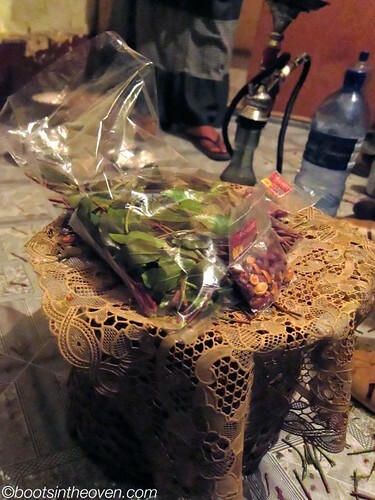 The waitress soon delivered our hookah and a huge bag of chat. The chat leaves are very tender, very bitter, and make a mess in your mouth. The good news is that you have to chew A LOT of it for a very long time to get any effect. Bonus! Appearently the civilized way to chew is to strip the leaves off the stalk and make little packets with two or three roasted peanuts in the middle. It does vastly improve the flavor. While I drank water, almost everyone else in the place sipped Sprite as a chaser. I smell a new ad campaign Coca-Cola Inc.! I don't know that I ever felt any of the effects of the chat, but spending a few hours conversing with Addis and Yohannis about their views on politics, America, food, pop culture and their aspirations was a definite highlight. 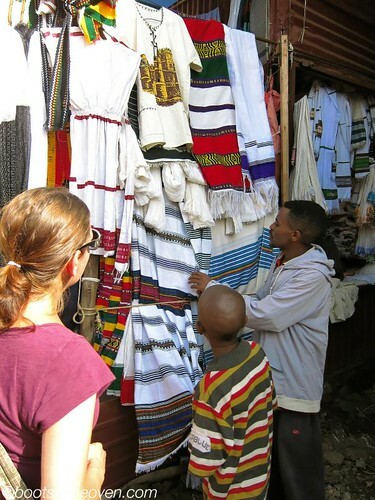 While I wouldn't rush back to Bahir Dar, I'm feeling pretty good that we got to visit. And not get busted by the cops. The food! The glorious food! I think this may be my fave country that you guys have visited so far. 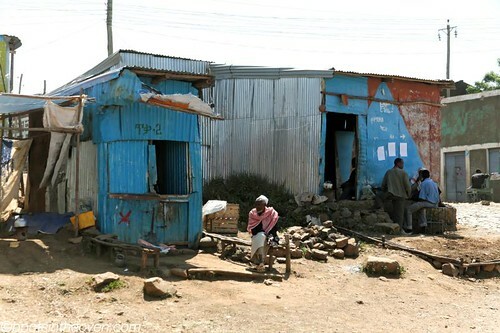 Ethiopia is a hard place to describe, isn't it? I thought I might get tired of the food while we were there, and it never happened - in fact, I'm still craving it weeks after we left! Holy Moly! Not only am I jealous for the awesome nibbles you guys had, but how awesome is the totally-local-tour? I can't even get into a slightly sketchy looking abode near my own place. Ethiopia it is! Logan had a lot of fun hanging out with Addis and Yohannis! And the food was AMAZING. I especially liked fasting days - so many delicious vegetables!